Cats in Marlborough, New Zealand have been returning home in terrible shape, appearing to have been “scalped” or soaked in methylated spirits or alcohol. The abuse and mysterious injuries have cat owners in the area on edge. The Society for the Prevention of Cruelty to Animals (SPCA) has confirmed it is investigating two incidents after the problem seemed to spread across Marlborough, appearing to be the work of more than one person. A Springlands woman named Melissa Smith found her nine-month-old cat, Blaze, with injuries to his head and nose. His claws were broken as if he had been digging, and he had the appearance of having been scalped. While Smith initially believed Blaze may have gotten caught in an opossum trap by accident, environmental group Picton Dawn Chorus chairman James Wilson said it was “improbable” that an opossum trap would catch a cat if it was used properly, as per Department of Conservation guidelines. Traps are set in trees and often baited to attract possums and not cats. Blenheim community constable Russ Smith said trapping cats is an ongoing problem within communities. 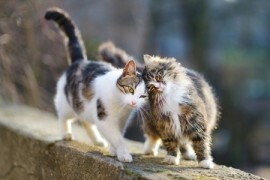 Cats are often captured as a way of lessening the number of feral cats. Unfortunately, police tend to focus on more extraordinary cases, and Polkinghorne suggested reporting concerns immediately after they surface. She pointed out that anyone found guilty of abuse could be fined up to $50,000 or receive a year in prison, something people in the states should consider as well.